The goal here is to build a couple of predictive models using different classification algorithms. To do that, you’ll need to install Python, its machine-learning modules, and its dependencies. The setup process can take from 30 minutes to an hour, depending on your available Internet speed and your experience level in installing projects that require multiple other projects. You can choose from a variety of programming languages and add-on packages to create and run predictive models. Python, together with the scikit-learn module, is an easy combination of programming language and machine-learning package to use, learn, and get started with quickly. Compared to other programming languages, Python is relatively easy to learn. Its syntax is straightforward and the code can be executed directly in an interactive console. You’ll know immediately if you wrote a successful statement, and can learn quickly from trial and error in many cases. Installing Python is an easy process that takes less than thirty minutes and just several clicks of the mouse. All of the default settings can be accepted during the installation process. You can install Python by downloading the installation program for Windows and other operating systems from the Python website. After you get to the Python website, you can look for the downloads link to get the file. After you’ve downloaded the file, just double-click it to begin the installation process. Here is a direct link to the download for your convenience. Go to the sci-kit website to get the machine learning package. Click the link to the Installation page and from there, look for the link to the installer in the Windows Installer section. You get a download link that takes you to the SourceForge website where you can get the latest version for your operating system. Here is a direct link to the scikit project at SourceForge. You’ll be using the executable file scikit-learn-0.14.1.win32-py2.7.exe for your installation. Click the link with the executable filename. Within a few seconds, you may receive a prompt to download the scikit-learn machine-learning module. Click the Save File button and wait for the download to finish. When the download is finished, go to your downloads folder (or wherever you saved the file) and run the file by double-clicking the filename. 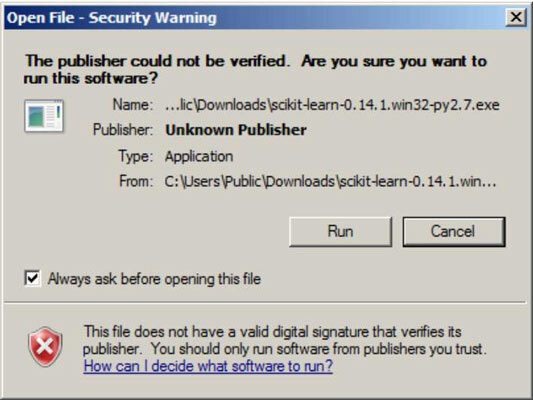 This may open a series of prompts or warnings that ask whether you want to proceed with running an executable file. Click the OK / Run button and continue. 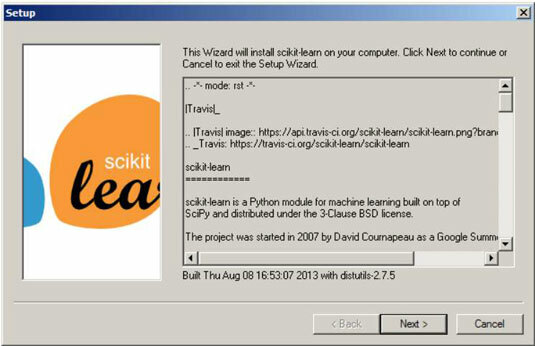 The next screen offers some important and useful information about the scikit-learn project. After you finish reading the information, click the Next button. 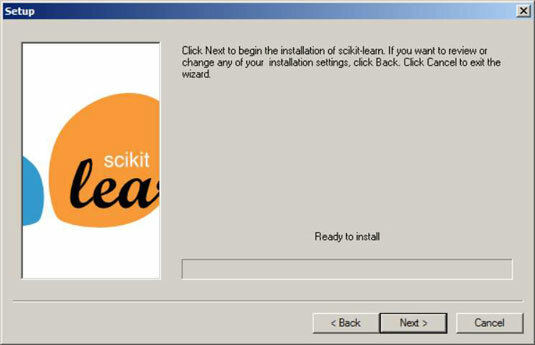 When actual installation begins, the scikit installer may ask you to select some custom options during the installation process. In most cases, accepting the default selections will be sufficient for running the examples. When a screen that asks where you want the module installed, you should accept the default directory. Doing so simplifies the installation process, as there are other dependent modules you need to install. C:Python27Libsite-packages is the default installation directory for third-party modules. 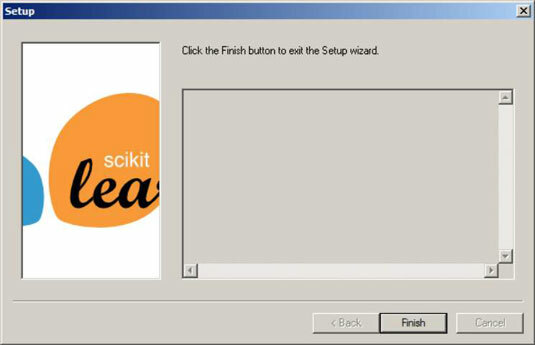 You’re now ready to install scikit-learn. One final prompt appears before installation begins. After the status bar is complete, you’re notified that your installation is complete. You’re done installing the main module for scikit. You’re now ready to install its dependencies.